Dogs add joy and excitement to life with their playful attitudes and flattering loyalty. However, just like humans, dogs must be taught wrong from right. Be a responsible owner and teach your pet how to behave well with these simple dog training tips. Studies show that punishing your dog is not as effective as rewarding your dog. Whether or not you scold your dog is up to you, but remember that this is only teaching your dog how not to act. Keep punishment to a minimum and reward your dog for every good behavior so they learn the right way to act. You can reward your dog in a variety of ways. Belly rubs, pats, cheerful words of affection, and special dog treats are all great ways to show you are proud. Just like humans, dogs are motivated to behave in ways that earn them rewards (which is one reason why paying people gets them to show up for work). Although you shouldn’t punish your dog through intimidation or pain, your dog does need to learn that there are consequences when he does something bad. Instead of using punishments, simply don’t reward bad behavior. If your dog begins jumping on your friend as a greeting, encourage your friend not to pet your dog or give him positive attention until he is sitting. Try to respond immediately to your dog’s behavior. After all, if you come home to find that your dog destroyed the new couch and you begin punishing him, he might not connect the two actions together if he committed the crime hours ago. Finally, be consistent with your training responses. If your dog always receives a treat when he sits quietly after hearing a knock at the door, he will make that action a habit. After you’ve potty trained your dog, you should focus your time on teaching him to sit upon command. This command is useful in all situations, but it’s especially beneficial when your dog is meeting new people. Even enthusiastic dog lovers won’t be thrilled if your dog jumps on them and muddies their pants or tears their new shirt. Once your dog understands how and when to sit, you can prevent him from running to other people and dragging you along on a walk. If he starts to bolt towards a neighborhood child, tell him to sit. Don’t rely too heavily on tugging on a leash to restrain your dog, because he could begin to think that people are scary if he feels pain each time he tries to approach a new person. And as a result, your dog might default to barking or growling when he sees a stranger. After you’ve taught your dog how to behave with simple commands like sit, stay, and come, have fun with teaching him entertaining tricks. You can even teach your dog to act a bit like a human by showing him how to give a handshake or stand. Finally, consider teaching your dog games like tug of war and fetch, as they can bring your dog joy and provide him with a way to release his energy. Because pets have short attention spans, they learn best when lessons are short and repetitive. Repeat each command about 10 times, and don’t try to teach your dog too many commands per session. A good rule of thumb is to keep lessons at about 10 minutes long. Start your training sessions in your own home. After your dog has learned some commands in the comfort and privacy of your house, take him to a dog park so he can learn how to obey in distracting situations. Training your dog is possible, but it takes patience. Don’t hesitate to seek help from a professional dog trainer. 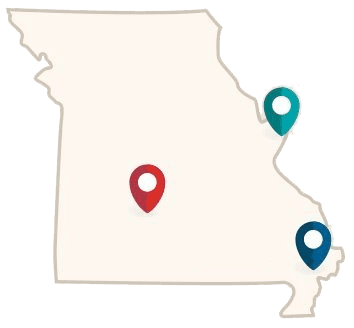 If you live near Springfield, Nixa, St. Louis, St. Peters, or Poplar Bluff, Missouri, contact Petsway to schedule a dog training session. We collaborate with professional trainers in our communities to ensure that our customers have access to top-notch dog training tips. To learn more, please visit our Dog Training page.